Personalized burgundy & white 58” arc vented little giant folding umbrellas can trigger a visual soiree, when carried during any crowded social event. 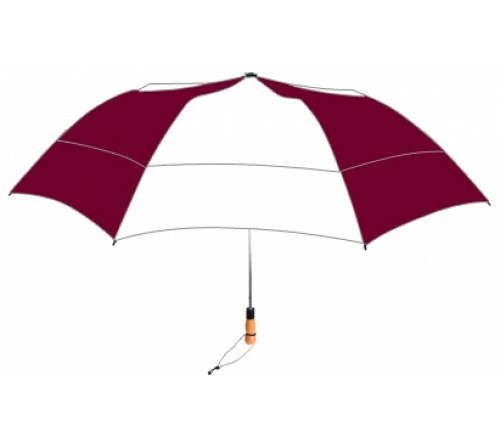 Logoed promotional burgundy & white 58” arc vented little giant folding umbrellas are sought by marketers in fashion, and other creative niches. 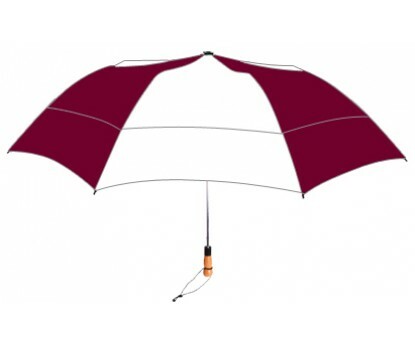 Features – a large venting and folding 58” arc burgundy & white canopy, automatic folds to just 22”, open function, sturdiest hexagonal chrome shaft, wooden handle with wrist wrap, fiberglass ribs, and is offered with matching fabric case with shoulder strap. Imprint area - 6”H x 8”W.